Working on interactive, user based experience, including interface to the real world & simulations — have to use other software and try to tie that back to SCORM. Need ability to capture more detailed data. Learning experiences are not linear. Need to bookmark location in virtual world where other state may change. Tracking real-world events — student driving a forklift. Would like to support team business simulation, currently done with moderators editing spreadsheets. TinCan: What cool or innovative stuff are you doing in your training, particularly as it relates to SCORM or other standards? Bill Parrot: We’re probably not mainstream; we look at the current courses that are being used in SCORM as page-turning type courses, where you’ll have a curriculum and perhaps a quiz, and we think that’s only one form of learning that can be done with SCORM. We’ve already looked at adding video in as a SCORM course and how can you integrate video better with the current limitations of the SCORM package; we also want to go further and just — we’re looking at more towards a gaming and simulation environment, and how you can make that portable through SCORM format, up to and including the use of actual interface to the real world. I’ll just use the term robotics, but I’m not thinking anything quite as exotic as an actual robot, but how do you interface with the real world and conduct simulations in a portable environment with SCORM as a shell. I don’t know how far you want to go with that. Kristin Loch: One of things that’s interesting is that SCORM has a set of standards and that’s great in a lot of theories, provided everyone is really working off the same thing, but everything we want to do and have been doing with more interactive, more user-based experience, rather than just presenting information in a digital page-turner, forces us to go to other software, and figure out how to make SCORM see that software, or information, rather than actually having it built into SCORM. TinCan: In a way, this is software you can’t really control but you have to just grab the outputs or inputs to that software and then wire it up to something that speaks SCORM? Kristin Loch: Right, which it would make sense that SCORM would have, or that a standard could have more flexibility than SCORM currently does, to be able to capture different points and different user pieces of data. Maybe it’s a rollover, maybe it’s the amount of time spent in a course. Currently, the way we work, it has to go through a series of steps, let’s say one through four, and then you have a completion. So there’s a beginning, middle, and end. And really, people don’t learn that way; they move in a much more fluid, circular environment, and we don’t have any way to track that. We could with other pieces of software, we could track it, but then you still ultimately have to output it in SCORM with a beginning, middle and end. Bill Parrot: You were saying pretty much that SCORM is linear. There’s not anything wrong with that; some training lends itself to that, but not all. So we’re trying to kick around the idea the limitations of SCORM — how do you attach meta-data in SCORM to something, and I’ll give you a really primitive example: say I’ve got a scene working in Second Life, where we’re doing some training and I won’t get into any details, it’s just — imagine a model in Second Life and you leave that model early. With SCORM, with a page-turner, you’d have a bookmark, so when you come back, you go right back to that page in the linear-thinking model. How would you get back to the same page, if you will, in a Second Life scenario. Kristin Loch: Where it’s continued to evolve without you there. Bill Parrot: Our thought was, you could modify the paradigm with Bookmark and have it be really a place-holder with attached meta-data, or a way to locate meta-data to reload your position in an active scenario. Now, this is all nebulous to us right now; we’re still trying to get the concepts down. But we’re thinking in terms of, there’s got to be some form of meta-data we can roll with to get from point A to point B.
TinCan: You’re thinking — is it that in Second Life, you ideally would want to take information on where you are in Second Life when you log out — you can’t preserve the environment because that continues to go; but you can take that information and potentially even store it in the location data-model element in the way that a bookmark would be, if you can just encode that information somehow so it will fit. Then you could load it back up from that encoded information? Bill Parrot: Yes. Today what we are trying to do, within the same metaphor model, that SCORM has, yet allow it to grow. That way, someone who really just needs page-turning technology could use bookmark as an actual bookmark. For someone who wants to use it as a — record of where you were in a series of events, that could be a pointer to meta- data that would accomplish the same thing. So that’s just a minor example, but we’re saying overall is that we’re limited to one type of construct, one paradigm, with SCORM and that is the page-turning model, some form of showing a linear progression of information. We do not perceive future-learning to be heading in that direction. We see that as an old paradigm, whereas a generation coming up, and even ourselves, we think more three-dimensionally, more interactive, and we think that SCORM needs to evolve in that direction. TinCan: What version of SCORM are you using? Kristin Loch: Currently, 1.2; 2004 has a little more capability, but still doesn’t allow for the full — what we’re really thinking in terms of is, and again, we’re using Second Life because it’s an easy comparison that everyone understands, but that kind of circular learning format where there is no set standard; maybe you check a number of different tasks — think of the video game concept, the RPG video-game concept where you have so many tasks that you have to do, it doesn’t matter if you do them 1, 2, 3, 5, 4, 6 — it doesn’t matter, but you need to somehow complete all these things and put that data together into an LMS. TinCan: With SCORM 2004 you have sequencing so it’s not necessarily just linear, but it’s still intended to be controlled by the content to say, okay you’ve done x, y, z, so therefore you have to take SCOs a, b, c. I guess you could leave it open, so it’s just a list of 100 different SCOs and depending on what a person completes, you can track data to the different ones, but it doesn’t really seem designed for it. Kristin Loch: And you would have to have 100 different SCOs and that amount of data getting put somewhere into your LMS, which most LMSs would not, most users of LMSs would not be thrilled with. TinCan: Because then they try to report them and say, What is this? Kristin Loch: Right; 100 different SCOs. It seems like there should be a way to merge that information and pull it apart and reformat it in a number of different ways, based on the user. Because there might be the digital page-turner that just wants someone to see seven different things, complete seven questions, completions, etc. But there should also be an openness for, what if I’m in HR and I’m dealing with something broad-based like anger management. There is no right or wrong answer, but I need to have a certain number of hours or successful outcomes, or something to that effect. But currently there is just the right and wrong, just the tracking of it. I don’t have any other information to pull out of that SCORM course, except maybe the amount of time. But again, that’s based on the LMS. TinCan: The amount of time, or something that’s hours-based in 2004 fourth edition, since there’s progress percentage it could be based on that too. Kristin Loch: But it’s cumulative or based on SCOs; it seems like it should be more flexible than that. TinCan: I guess the different tasks you are talking about too, using the different objectives or interactions within the single SCO is similarly inadequate for it because it’s not enough — what’s one interaction in your system is much more than you could store in one SCORM interaction, right? Essentially you want something that lets you report as much data as if it was a SCO, but reporting on it, you wouldn’t want it necessarily broken out as if it was a SCO, you would want the ability to report summary data and much more detail. Bill Parrot: I think we’re helping each other here and that’s good. We’re trying to figure out how to really get into this model and make it portable. We’d love to have the SCORM format because its logical, and — or, whatever “new-SCORM” will be. We’re trying to get this together here, that’s what we’re trying to do in our R & D. So this is great. Kristin Loch: One other thing we really feel like, as we move towards a more digital world, there’s no — SCORM doesn’t allow for essentially user-generated content, or interactive content in that respect. Bill Parrot: So the course grows based on human input, a community input. And there might be two versions of that, where you’d have one where it grows dynamically without checks or balances from a moderator, and then one where it grows dynamically but is moderated. That way you can pursue — I can see people using either one of the models. That would be a metaphor very similar to a wiki right now, which is why I’m mentioning that, but the ability for asynchronous communication of this information can only enhance the course and allows more user input, easier detail. Kristin Loch: Another thing we thought of in regard to that is the ability to have more group-based learning situations — you could have a problem-solving session with multiple users and different location, etc., that might be able to affect how the learning develops. Bill Parrot: One example we were talking about was a business simulation. The clients that I work with on this were doing this 100% in excel spreadsheets, with everyone sitting around using notebook computers at this big conference table and then their game moderators would come out and say to one guy that you just received this order, and then they would make changes in the spreadsheet and then move it on down the table. And I’m thinking, how primitive! But I understand what they’re trying to do; they’re trying to simulate a business in real time and principles. They were very simple principles that were happening in this spreadsheet, so it could be done very quickly, but the ability to do interactive changes in the SCORM course would be marvelous. I’m thinking that might be more on the course designer’s back-end use of data, but then how do you make that work? Because you really can’t have a SCORM course go back to a single vendor’s database. We’re not sure how that would work, but I could see an interactive method, a way of exchanging data, and maybe this is that meta-data model again, I’m not sure. Kristin Loch: Yeah, because what would you send back? You would not be able to send back a real-time updating and tracking — maybe we’re just not thinking about this correctly. You would want to be able to somehow capture all this data as it progresses, to be able to assess maybe a learning curve or a final outcome. There is no real outcome to it that’s a single score or completion. From that, you would want to have all the data in between. Bill Parrot: This would explain what our quandary is. Right now, if you had several people open up a SCORM course, they would open up a separate instance of that SCORM course to go through. And I guess what we’re looking for — how would you have multiple people open up the same SCORM course in order to have interactive data? I guess it would be like a networked model of the course. That’s the metaphor we’re thinking right now, so you could have real-time exchange between students regardless of geographic location. More than likely this would probably be used in a classroom setting based on what I’ve seen, but moving forward, how would you have interaction — that’s kind of what I’m trying to say: If each one opened up their own separate version of the course, I’m not sure how they would interact with the data. TinCan: So it’s need to be able to say that all these people are starting — it’s one session, like in a gaming scenario, you decide you’re going to play against three people, and you’re all playing the same game and it would be much like that, where you have your own individual connection but then there’s some shared data on the game server. Bill Parrot: We’re looking at SCORM as a wrapper around a solution and I hope that’s the correct metaphor. Because we’re thinking multiple businesses with different LMSs talking, using SCORM as the ability to interact with our solution. Kristin Loch: I think some of the other things we’ve noticed with SCORM are that you’re really creating a course and putting it out there, and that requires the use of broadband technology, and that broadband is delivering pre-created content, and there’s nothing that can be created on the user-end. Bill Parrot: Are you familiar with XAML technology as an example, here? Several browsers report XAML right now, you’ve probably heard of Silver-light or Adobe Air. What they’re doing is using language, very similar to XML, that reaches out through the client and talks to the client’s computer. Rather than downloading huge files, it’s using the client’s computer to generate the graphics on-screen. I realize that’s a huge simplification of this technology, but that’s essentially what it is. And we’re not sure, we haven’t really developed this, this came out of a conversation yesterday — could you run a XAML application through SCORM? I would think so, but I don’t know. Where it would be able to interact with the client’s computer, and I’m sure you guys have talked about this before. TinCan: We haven’t we’ve been thinking that the new API should say less about content than SCORM, to allow more content to be able to use it. Kristin Loch: Both Bill and I work on the technical aspects and I work on the content-end of both an LMS and the content delivery system, so to me, and what makes the most sense is that: why are there so many restrictions in SCORM? There are so many pieces and parts I have put together all the time. Why don’t we have the ability to have — it seem like we’re always saying, this is what we want to do, how can we fit that into SCORM? Rather than saying, Here’s where we’re just going to plug in this communication method, or whatever the beyond-SCORM ends up being. Bill Parrot: A couple of quick ones were, and this could just be an enhancement to what SCORM already is, just getting back to simple courses right now. Right now there’s no ability for on-demand personalization, which believe it or not, we get asked for — How do I make this course specific to this company or this user? Or language? Language I realize is a little more difficult; but to take user information and pass it into the course so it can say — as a member of a given company how would you react in this situation? There’s no way to interact with a course dynamically in this way. That seems like it should be fairly simple, but we haven’t figured out how to do that yet. Kristin Loch: We’re thinking more than just the name, but maybe you could take a picture with your web-cam and suddenly when an ID card comes up, showing what your ID should look to get into the security office, there is your picture on the ID card. Or meta-data information about a user could be incorporated. Kristin Loch: Previous experience, jobs, or training — all sorts of meta-data that could be incorporated on an ongoing model of learning. Bill Parrot: We might end up having to use generic tags, so that it could be specific. They wouldn’t want to have, what was your job title, or something. Kristin Loch: So far, and maybe this is just a knowledge base for us, we haven’t been able to find a way to feed in that information on the fly. TinCan: If you had, as you say generic tags, the tags wouldn’t so much have to be standardized, you’d have to tell whether a tag was populated or not, but if it were named fairly uniquely, probably industry best practices would crop up and there would be some kind of agreement over time. If that ability to just add some sort of tags was available. And you could even imagine that if you provided some sort of way to have binary data you could have a tag that was an image. Kristin Loch: The thought there being, and we do lots of different types of training, a lot is manufacturing. So to some extent you have a certain amount of training that can be on a computer, at a desk, etc., but then there’s a good deal that has to be done physically, so if you trying to train someone to drive a forklift — right now, we don’t have any really good way, other than through an LMS input, to track that a certain student did forklift work. But if you had the ability to scan a code or have your smart device track what you’re doing and have that feed directly into an LMS, you would take the back-end off of the record keeping. In other words — currently, you would have to take an online course that instructs you in all the basics of driving a forklift. This is the kind of fuel it uses, etc., but then the second part of the training requires that user get on an actual forklift and operate it correctly. There is no way without an administrator or group leader, etc., who could simply enter in a course to say these users met these parameters. But currently we are in an age where everyone has a smart device on them. Why can’t we just put a sticker on the forklift that is barcoded for back-up, drive, and park. Scan each of those and have it right into an LMS as a SCORM completion course. Bill Parrot: Like how people do inventory now; it would give us — the course would be running, it would be an instructor-led course, but rather than having all this data entered manually later, by an individual, they could go ahead and say, Run down the street here with your forklift, do this and when you get to point A, take your card and scan this using this device, and then it automatically updates that you’ve passed this phase of the course. […] Getting a wireless scanning device is easy; getting it up to forklift is easy; it’s in these environments: how do you get the interactivity with an LMS. TinCan: Have you looked at the LETSI run-time web services at all? Bill Parrot: We did have one more comment about players. Right now, the way things are rigged up, corporate develops the course as their own player, so from an end-user’s point of view, you have courses from six different vendors, you have the potential for six completely different players. Is it possible to have some form of player plug-in where you still have, you could use the proprietary or customized player where the player is not so much bound to the course. Right now, we don’t see how that’s possible, because the course has to interpreted by the player, and there is that disorientation or branding issues — we hear more about the branding than the disorientation, that people run into when they’re trying to use multiple vendors for courses. TinCan: I keep getting very conflicting desires on this – whether the LMS or content should control the UI. Bill Parrot: That’s our number one client request: branding that is theirs, completely through the product line, all the way down to the course level. Kristin Loch: And it seems like there could be a very thin layer between the content and the LMS that just played it, so the company could buy a standardized one or develop their own that’s pink and purple polka dots with spinning stars on top that they always wanted — and everything they could ever implement, every piece of content purchased from every vendor could run through that player that is there. TinCan: When you say player, you mean the forward and next buttons, table of contents, etc. That seems to come back to so many people using single SCO content and then essentially they create their own player within that SCO. Kristin Loch: Right, and we see it a lot, like with Articulate. That’s a huge one where people can customize their different looks, etc, to their formats; but we work off a proprietary format so it doesn’t look like all the Articulate courses, and the Articulate courses can’t look like ours. And another vendor wouldn’t be able to do the same. And you could get them close, but there’s no way to — not without a huge investment. TinCan: Do you do multi-SCO? Kristin Loch: We have done it, but not usually. Usually our courses look for just a completion, so we have the capability for multi-SCO, but most people just want a single score at the end. TinCan: So it’s almost like you would want multiple-SCO but not to track as multi-SCO. It seems like the one — the way that would work right now to get the LMSs UI used instead of your own would be to break into multiple SCOs and then use the LMS forward and next, its table of contents, etc. As I said, I’m seeing different requests on this, because I have other people who are saying they specifically want to avoid using the LMS’s UI, they want to be able to roll their own, but they also want to be able to query the LMS to read what the table of contents should be so they can draw it themselves. Bill Parrot: One other thing is a completely disconnected environment to run a course, and have the ability to have a file immediately uploaded afterwards, or shipped via some physical — USB or something. We still have clients that need this and I can think of two right now. One is one client in Alaska who still wants to train but who has no bandwidth, because where they are, there is no internet, but they still want to use our LMS. We’re trying to fix them up with a computer and something they can run based on a generator and then they have to physically copy stuff out; we’re trying to get them to use a USB stick. They’re using CDs to take their information back and forth. Kristin Loch: I think it’s because they have no USB drive, but that’s an entirely different issue. Bill Parrot: Then it would go back to the central office via a sled dog or however they get it there; then they load it up to the LMS, get all the reports, and take paper print-outs back to the site. Believe it or not, we have more than one site like this. So it’s a crazy situation, but that’s one scenario. We would like to provide them with more technology, but right now, depending on their budgets and the equipment they have, that’s limiting. Then the fact that there’s no internet and we’re trying to pursue a cloud-based solution, because that’s what looks to be the future, but we’re getting more and more of these disconnected questions. Another example of a higher-tech situation is the military. We’ve got people with the computer processing necessary for whatever they want to do, but because of theater operations, they don’t want to have these boxes connected to the internet. They want to be able to take data, sanitize it, then throw it in a centralized LMS at a later point. So, we still need some form of disconnected model; I know you guys had one, but it was discontinued. Are you getting a lot of people wanting disconnected training? TinCan: A fair bit, it’s not at the top of the list. I think some directions we are looking at going in in terms of API that might not solve that problem, but help create a standard solution to it; if you’re looking at a web service API, for example, now you have a standard format that the data is being transmitted in and you can potentially proxy it and have a proxy that sits on that data and spits it out and even in a physical form if you wanted to write it that way, and that could be something written by a third party, neither the content creator nor the LMS. You just stick that in the middle. So I think it’s a problem we can’t necessarily solve directly, but we can enable some pretty good solutions. Kristin Loch: I think standardization in that is the key. Because we can do some of our courses, but if another vendor comes in, we’re stuck. Even if they want to bring it into our LMS, we can’t help them there. So yeah, some standards would definitely help that. Bill Parrot: The only thing left on our list is multiple languages, but — we touched on that. TinCan: More meta-data that you want to know when you launch the course? Bill Parrot: We hoped to have great success with the Google engine, integrating that in a more hard-wired solution, more proprietary than SCORM. Unfortunately, if you watch YouTube, you know exactly what happens when the Google engine gets involved. It does a pretty good job, sometimes. The problem is proprietary language, or high-tech speak that works sometimes, but doesn’t work quite well. Right now, the only solution we’ve got is basically storage points. We have to know the browser language, which is easy, and we would go to a different file, a resource file, to get the exact language that we’ve interpreted correctly for this student. I don’t see a solution in the short term for that because of variations in language. TinCan: I think automated translation is very bleeding-edge, not a solved problem. What sort of vendors are you integrating with, or are you? To provide courses; obviously to LMSs, but beyond that? Kristin Loch: It’s funny, but we’ve had probably the hardest time integrating courseware with the largest LMS vendors. So that’s what’s interesting to me, and it seems kind of almost, a fault with SCORM, because there’s so many options with how you can insert data but how it’s interpreted by the LMS changes. Bill Parrot: As far as using SCORM data in our LMS, I’ve seen several variations of the same standard and we have to occasionally tweak our code to make sure it’s interpreting field information that it’s picked up, correctly. So there’s still some room in there for standardization. TinCan: Your LMS: do you run it yourself internally, and just host it yourself, or is it run at your customer’s sites? Bill Parrot: We have both. I would have to say that 99% of our stuff we host and manage, we update the code. We do have some folks who want to host our LMS. We try to get away from that model. But we do run into that and we have to service out our courses or even courses or what have you interfaced with this model, running remotely, and that’s pretty rough. TinCan: Just providing support for courses that are running on a remote customer’s installation is difficult? Kristin Loch: And the reason we can’t do it AICC is because the LMS would see them all as separate courses, and they need, for reporting, to all be a single course. You might have fifteen locations and each hosting their own media, but somehow they have to be seen as a single course, not as fifteen separate courses. Since it would be hosted on the end- user’s network, it would be seen as fifteen different courses. Bill Parrot: This one of the most difficult experiences we have training. We are trying to develop our internal standards to manage that easier and it is a difficult model to handle. TinCan: That’s a problem that I’d say is straight out solved by RTWS as it is. Bill Parrot: Should we talk about dual-reporting in this session? We’re currently doing it with AICC, and someone runs a course and it updates our database with their score information and also updates their database. So if someone is running SAP and our product as well, we can update two completely disparate systems after running the course. That’s a nightmare for us too, but again, we do that with AICC and not SCORM. Kristin Loch: It should be possible, but again there’s no standardized way of doing that; so it may be different with every vendor we work with. Bill Parrot: I’m not sure that’s a SCORM-solvable issue. 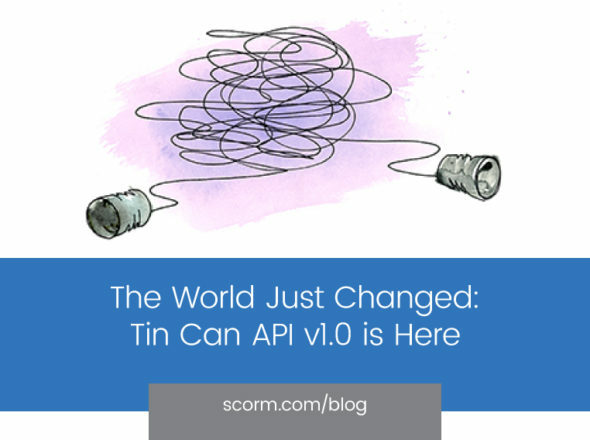 TinCan: Not necessarily SCORM but a future communication API — again, if you have a web service API you can just do multiple calls to multiple systems. Is that something you really to work where the course communicates to two LMSs or do you also kind of want a standard way for an LMS to pass information off to another LMS? Bill Parrot: That’s more what I’m thinking. Is that, you have some sort of web service talking to another web service and off you go. I’m concerned about how much complication we’re adding into the course, if it’s one vendor talking to another vendor. Kristin Loch: A standardized form of communication for the LMS to LMS communication would be ideal. TinCan: It seems like what an API that’s used for courses and we don’t care where it’s coming from, to communicate back to an LMS can also be used for an LMS to communicate with another LMS. So if that use-case is kept in mind, then maybe it can be supported. One topic on the forum is wanting to get at run-time data, so that courses should be able to get their own reports by querying the LMS, or they should be able to look at — with some sort of authentication mechanism they should be able to look at either aggregate scores from prior attempts, etc., and would that be something you see a use for? Kristin Loch: Yes, I think it would if it was not terribly heavy, if that makes sense. It sounds like — because people will infinitely ask for that information — all of it, any of it, etc., in 35 different ways. Like a course-level — these 50 learners have taken the course; 25% of get question 3 wrong, etc. Whatever you could pull from the course, they would want to see. Bill Parrot: We’re talking an LMS to LMS API? Not necessarily pulling that into the course? TinCan: It could, but anything that’s on the API, the course could use, potentially another LMS could also use; but people have talked about creating content and then are frustrated by the way the LMS reports on it and would like an alternative. If an LMS has an API to pull more reporting data, then you could potentially have a third party reporting tool that does reporting more to your liking and use it to pull data out of an LMS. Kristin Loch: I’ve had a number of requests for this kind of information and one of them, I just had a conference call with this guy a couple days ago. He’s only doing computer-based training to test himself, he runs a training company for nursing. So he does all kinds of hands-on training and wants those nurses to see where they stand in relation to every other nurse who has taken it. So he might travel to five different locations and wants to know why location B did better than A, and he wants to be able to judge how his training is effective in a classroom environment. Currently we can track individual learners in the LMS and we could track course data for those learners, but we don’t have a way to compare single users with multiple users within the course. The only caveat there would be that it would need to be thin enough not to interfere with anything else, an API that is easily plugged in, and I love the idea of a third-party reporting company, because inevitably everyone wants a particular tweak — so a third party API to plug in for that is really cool and would make our lives much easier.